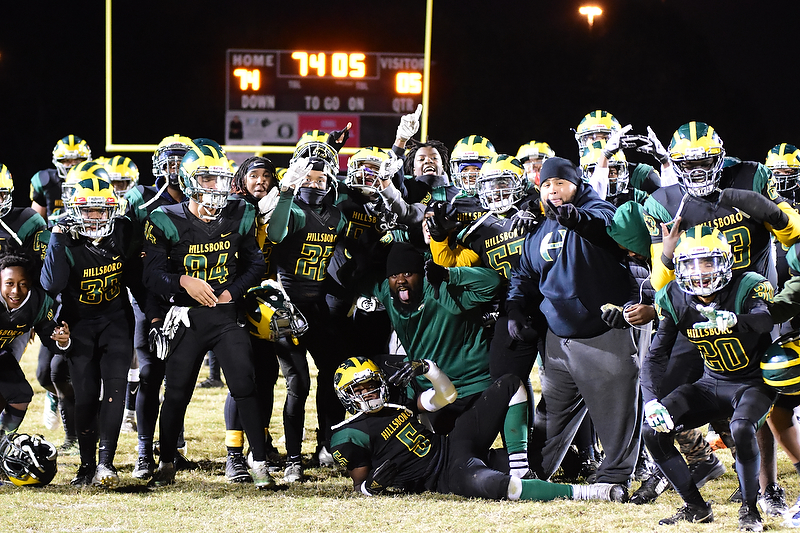 The Burros of Hillsboro High School advance to the 3rd round of the TSSAA playoffs with a performance of an explosive offense against Shelbyville Central Golden Eagles cruising to victory on their de facto home field at Overton High School. 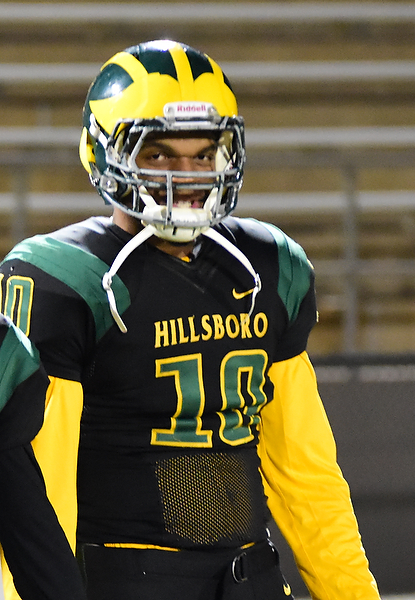 Hillsboro does not have a ‘home’ field due to massive construction and renovation for the new high school. The Burros last home game was October 29, 2017. They have played every game on another school’s field this year and both Hillwood and Overton have graciously shared their fields so that our Burro fans are close enough to the other schools to come cheer them on. Hillsboro finished the game with 560 total yards of offense and the defense stepped it up allowing only 140 total all-purpose offensive yards by Shelbyville. Offensive standouts include junior RB Brian Covington with 394 in 22 carries averaging 16.25 yards a carry in the post season. His first run of the game was a 92 yard first-down rush enabled by the “B-Hop Boys”who are Hillsboro’s front five linemen that opened up boulevards for Covington to zip through. Covington (#3) finished the night with 3 TDS that helped set the tone for the rest of the game. Darius Smith (SR. #15) also had a standout game with 140 yards and 2 TDS who played at both the position of Quarterback and Running Back. Harold Jamison, JR. (SR. #33) followed with 104 yards and 2 TDs. 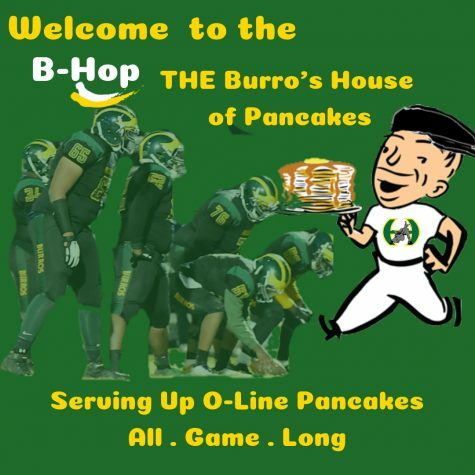 With the explosive running backs, it would be easy to miss the excellent performance of the Burros defense. The defense, lead by Memphis University commitment, Joseph Honeysucker (Sr. #10) accrued 6 QB sacks, 2 fumble recoveries and interception. The defense held Shelbyville to 20 points in the first half and kept them scoreless even when they reached the read zone twice. Memphis bound Joseph Honeysucker finished with 7 tackles and 1 sack to go along with 3 tackles for a loss. Jamaal Thompson had 4 tackles including 2 for a loss as well as a sack. Jaylon Henderson, Jevon Russell and Jamaal Thompson accrued 14 tackles between them and kept the Golden Eagle QB from reaching his 300+ yards a game. What has plagued the Burros off and on all season and was particularly troublesome in this last game are the number of penalties the Burros seem to be able to pick up without even trying. Against the Golden Eagles they had 14 penalties for 140 yards. Had the defense not been able to shut down Grammell’s passing game, the Burros might have dug in early and had to play from behind. Hillsboro advances to play their own region rival, Beech High School. Last year, the Burros met Beech at home in the regular season and again in the same quarterfinals of the playoffs. Beech won both those games and eventually advanced to the TSSAA championship. They are a team that always seems to thwart the Burros, but if Burros can hold the penalties to a minimum, they might have a chance to advance to Cookeville for a chance at a state championship. Beech’s Ja’Sean Parks (jr. #7) has an unofficial cumulative yardage of 1438 yards averaging 7.4 yards a carry. He has 12 TDs and his longest rush this year has been for 66 yards……..Supporting Parks from the backfield are two half backs that are close to earning their own 1,000 yard seasons. Tyson Jefferson (SO #3) and Aaron Parks (SR #36) each have over 850 yards and 25 TDs yard this years……Wide Receiver, Zach Oden (#1) is possible the biggest threat to the Burros and Buccaneers passing game.